Loaders are used extensively in construction operations to handle and transport material, to load haul units, to excavate, and to charge aggregate bins at both asphalt and concrete plants. The loader is a versatile piece of equipment designed to excavate at or above wheel or track level. The hydraulic-activated lifting system exerts maximum breakout force with an upward motion of the bucket. Large rubber tires on wheel models provide good traction and low ground-bearing pressure. A wheel loader can attain high speeds, which permits it to travel from one job site to another under its own power. Most wheel loaders are diesel-driven, rubber-tired machines (Figure 4-1). They are available in varied sizes and capacities. Some small skid steer type loaders maybe gas driven, but they are seldom used for major earth moving operations, and more often used for site clean-up. A power-shift transmission with a torque converter gives the loaders fast-movement capability in both forward and reverse, with a minimum of shock. This lets the machines maintain a high production rate. The hydraulic system gives the operator positive control of mounted attachments and assists with steering. Most loaders have pintles or towing hooks for towing small trailers or light loads. 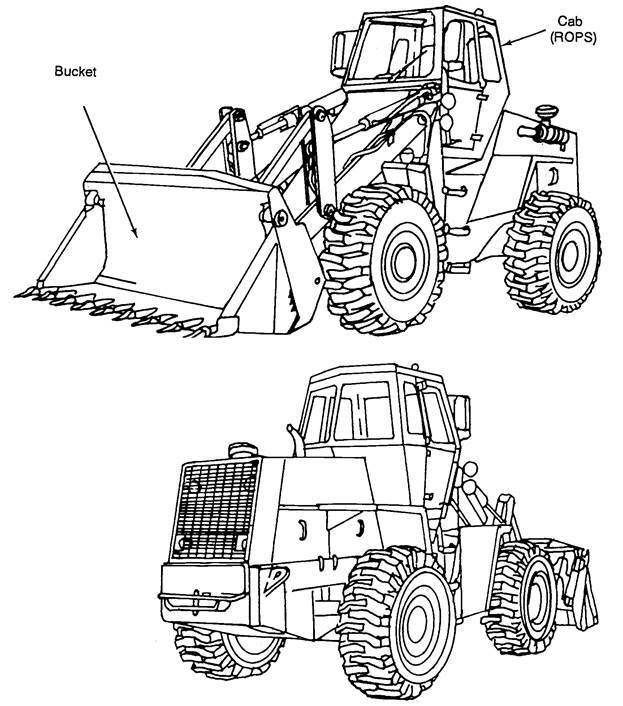 The most common loader attachments are a shovel-type bucket or a forklift (Figure 4-2). The loader’s hydraulic system provides the power necessary for operating these attachments. Hooks (designed for lifting and moving sling loads) and snowplows are other available attachments. 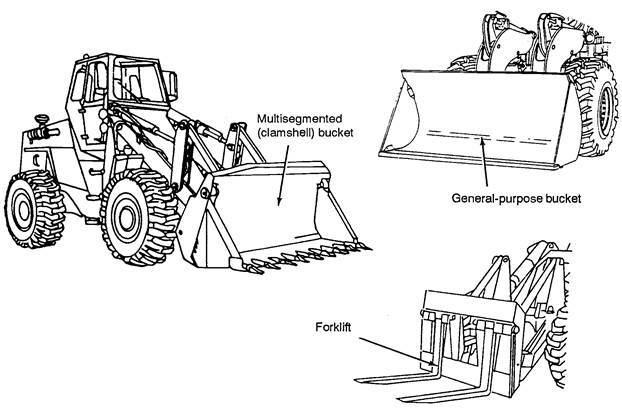 Buckets may be general-purpose (one-piece, conventional) or multipurpose (two-piece, hinged-jaw) (Figure 4-2). The bucket attaches to the tractor unit by lift arms. Buckets are made of heavy-duty, all-welded steel and vary in size from 2.5 to 5 cubic yards. The bucket teeth are bolted or welded onto replaceable cutting edges. Bolt-on, replaceable teeth are provided for excavation of medium-type materials. The multipurpose bucket provides the capability to use the loader as a dozer and to grab material. A forklift can be attached to the tractor unit in place of a bucket. Designed for material handling, the fork attachment is made of steel with two movable tines. Typical uses for a loader are loading trucks; stockpiling materials; and digging pits; backfilling ditches; lifting and moving construction materials; and, when equipped with rock-type-tread tires, operating in and around rock quarries and mines. They may also be used for many miscellaneous construction tasks. These include stripping overburden, charging hoppers and skips, lifting and moving forms for concrete work, moving large concrete and steel pipes, assisting with plant erection and maintenance, and towing small trailers and light loads. Two critical factors to consider in selecting a loader are the type and volume of material being handled. Loaders are excellent machines for excavating soft to medium-hard material. Loader production rates decrease rapidly when excavating medium to hard material. Another factor to consider is how high the material must be raised. To be of value in loading trucks, the loader must be able to dump over the side of the truck’s dump bed. A loader attains its highest production rate when working on a flat, smooth surface with enough space to maneuver. In poor underfoot conditions or when there is a lack of space to operate efficiently, other equipment may be more effective. When loading the bucket, it should be parallel with the ground so its cutting edge can skim the travel surface and remove ruts, obstacles, and loose material on the forward pass. As the cutting edge contacts the bank or stockpile, move the loader forward at a slow speed and increase the power. While penetrating the material, raise the bucket. Crowd the material into the bucket and roll the bucket back to prevent spilling. Maintain the bucket in an upward position while backing away, to prevent spilling. Proper positioning of the equipment that will receive material from the loader is necessary for maximum production. This cuts down on maneuver time. When loading trucks from a bank or a stockpile with a single loader, use the V-loading method. Use the following steps for the V-loading method (Figure 4-3). Step 1. With the bucket lowered 1 to 2 inches off the ground, head the loader toward the bank or stockpile in low gear. Step 2. Move the loader into the stockpile and manipulate the lift and tilt control levers, simultaneously curling back the bucket and raising the boom slightly until the bucket is full and completely rolled back. Maintain power without spinning the tires. Step 3. Hold the bucket in the upright and curled position, and back away from the stockpile or bank. Step 4. Approach the haul unit at a 90° angle, lifting the bucket high enough to clear the haul unit. Step 5. Proceed slowly forward until the bucket is over the haul unit. Do not touch the haul unit with the front tires. Step 6. Dump the bucket by rolling the bucket slowly forward. Do not let the bucket hit the haul unit. Step 7. Back away from the haul unit while simultaneously lowering the boom and leveling the bucket. Repeat the above steps until the haul unit is loaded. NOTE: While these machines are flexible and can dig under very awkward conditions, the best production is achieved by keeping both the angle of turn and the travel distance to a minimum. This procedure can be used with the multipurpose bucket for handling rocks, timbers, or stockpiles of loose material. Step 1. Center the front of the bucket on the middle of the first load to be picked up. When about 5 feet from the load, begin to open the bucket. Step 2. Move the loader forward and make contact with the load. About 2/3rds of the opened bucket should penetrate into the material to be loaded. Step 3. Close the bucket to secure the load. Step 4. Position the load 10 to 14 inches above the ground. Keep the loader bucket as low as possible. Step 5. Maneuver the loader to the desired location for load placement. Step 6. Open the bucket fully. Step 7. Raise the bucket high enough to clear any previously dumped material. Ensure that all of the material is out of the bucket. Step 8. Close the bucket. Step 9. Place the bucket in the traveling position (10 to 14 inches above the ground). Repeat the above steps until the task is complete. A loader can dig excavations if the material is not too hard. 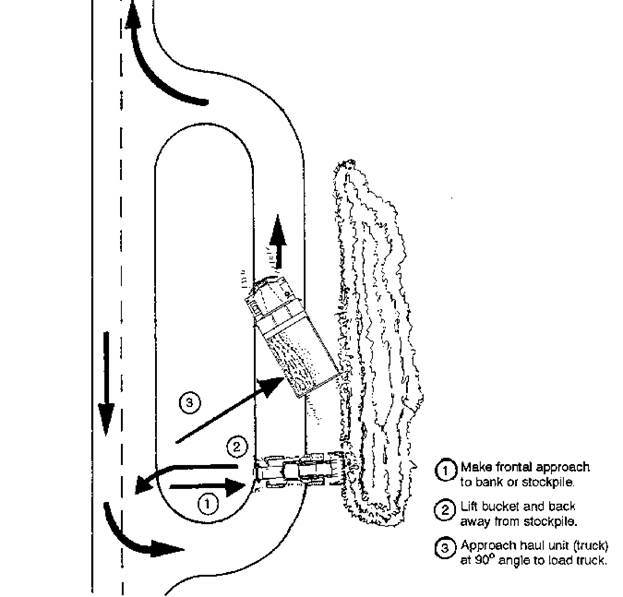 The operator should first construct a ramp into the excavation (Figure 4-4). Because the loader works best when excavating above wheel level, the ramp allows the loader to work in that manner and later provides egress to bring out the material. The following procedures are used to construct a ramp. Step 1. Determine a starting point for the ramp. Step 2. Position the bucket so it is pitched forward. Step 3. Move the loader forward, gradually penetrating the earth by lowering the lift control lever. • Keep the loader in as high a gear as possible without causing the tires to spin excessively. • Regulate the depth of cut using the lift control lever. Step 4. Retract the bucket fully. Step 5. Place the lift control lever in the raised position until the bucket is high enough to clear the surrounding area. Step 6. Dump the loaded bucket onto a stockpile or into a haul unit. Repeat the above steps until the excavation is complete. The multipurpose bucket handles sticky material (which has a tendency to cling to the bucket) better than the general-purpose bucket. A clam-type digging motion works best in this material type. When digging medium to hard material, a greater efficiency can be achieved by first breaking or loosening the material. 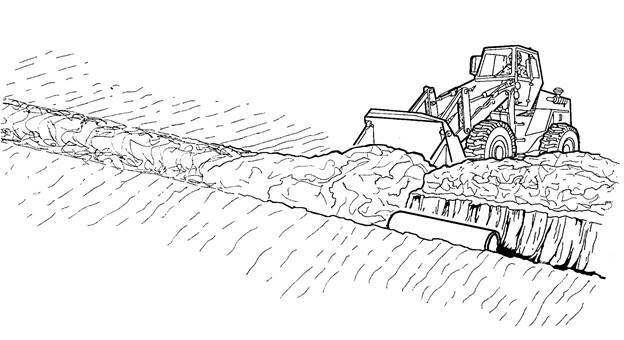 When backfilling trenches, lower the bucket to grade level and use the forward movement of the machine to push the stockpiled earth into the trench (Figure 4-5). This type of work is ideal for the loader as long as the bucket is as wide as, or wider than, the loader’s wheels or tracks. Narrow buckets cause the wheels to ride up the stockpile. This raises one corner of the bucket and requires more passes. Use the following steps to perform backfilling operations. Step 1. Align the loader with the stockpile (either to the left or right side) while approaching at a 45° angle so that one-third of the bucket will contact the stockpile. this case, work from the edges. Step 2. Adjust the bucket by moving the lift control lever to lower the bucket to just off of the natural ground. If using a multipurpose bucket, move the bucket control lever to open the bucket to the clam position. Step 3. Move the loader forward and gradually move the material. Keep the loader in as high a gear as possible without causing the tires to spin excessively. Step 4. Move the lift control lever to lower or raise the bucket to cut and spread the material the length of the trench. Step 5. Move the lift control lever to raise the bucket 10 to 14 inches off the ground before reversing direction. Step 6. Reverse the loader and return to the stockpile. Repeat the above steps until the operation is complete. Step 1. Move the loader forward until the front tires contact the bank. Step 2. Move the lift control lever to raise the bucket all the way. Step 3. Move the tilt control lever to slowly tilt the bucket to the dump position. Step 4. Pull the tilt control lever to tilt the bucket back to the standard bucket position. Step 5. Back the loader from the stockpile and lower the bucket to about 10 to 14 inches off the ground. Step 6. Back the loader to the start of the work area. Repeat the above steps until all of the material is stockpiled. Many factors affect loader production: operator skill, extent of prior loosening of the material, slope of the operating area, height of the material, climate, and haul-unit positioning. Table 4-1 shows bucket fill factors for converting rated heaped-bucket capacity to LCY volume based on the type of material being handled. Table 4-2 gives average cycle times for wheel loaders to excavate and load with no extra travel required. Use the following formulas and step-by-step method for estimating loader production. Step 1. Determine the material type and the rated heaped-bucket capacity of the loader. Step 2. Select the bucket fill factor from Table 4-1 based on the material type. Step 3. Determine the average cycle time from Table 4-2 based on the size of wheel loader. NOTE: If necessary, add any round-trip travel time to the cycle time found in Table 4-2 (as would be the case when charging feed bins or hoppers). Determine the total travel time using the same formula found in Chapter 3 (Scrapers), under Production Estimates, step 7. Base the speed on the gear capabilities of the loader matched to the site’s travel conditions. For travel distances of less than 100 feet, a wheel loader (with a loaded bucket) should be able to travel at about 80 percent of its maximum speed in low gear and return (with an empty bucket) at about 60 percent of its maximum speed in second gear. Expect slightly higher speeds for longer travel distances. Step 4. Determine the maximum production rate using the following formula. • Work-site dimensions, the depth of cut, and the amount of movement required. • Surface conditions and weather, including the season of the year and drainage. Step 6. Determine the net production rate in LCY per hour. Multiply the maximum production rate (LCY per hour) by the efficiency factor. 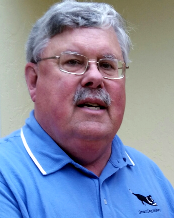 What is the net production rate (LCY per hour) for a 2.5-cubic-yard wheel loader loading moist loam? Assume average working conditions. Determine the net production rate in tons per hour. Multiply the net production rate (LCY per hour) by the material weight (tons per LCY). Divide the material weight by 2,000 to convert pounds per LCY to tons per LCY. What is the net production rate in tons per hour of a wheel loader working in loam (2,200 pounds per LCY) with a net production rate of 263 LCY per hour? • Determine a soil conversion factor if necessary (see Table 1). • Determine the total time required. The formula used to determine dozer production (Chapter 2(Dozers), Production Estimates, step 10) is an alternate method to Travel Time. • Determine the total number of wheel loaders required to complete the mission in a given time. The formula used to determine dozer production (Chapter 2(Dozers), Production Estimates, step 11) is can be used. • Block the bucket when working on the machine. • Use caution when removing and replacing the lock rings. • Do not work between the wheels and the frame while the engine is running. • Use caution when operating close to the edge of a trench or when working under overhangs created by digging into banks or stockpiles. • Travel with the bucket at or below axle height. • Do not carry or lift personnel in the bucket. • Ground the bucket and set the parking brake before leaving the machine.